A great wardrobe design can not only improve the décor of your bedroom, but actually add value to your home. Delivering a comprehensive, modern and stylish range, this framing system offers great design flexibility, which, combined with easy installation, will be a welcome addition to any household. 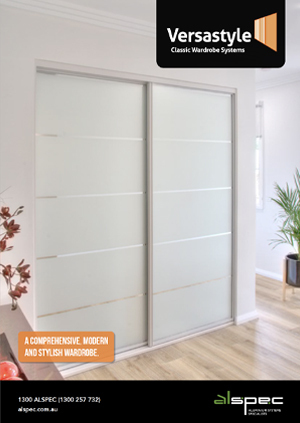 Featuring modern profiles that are suitable for opaque and coloured glass as well as mirror or board doors, this aluminium framing system uses load bearing rollers which are designed to allow the doors to glide easily on the aluminium track. For a history of great service and quality built products, when considering a wardrobe system there's only one place that has all the solutions - Alspec® Versastyle®.